Before, during and after physical activity, it's important to keep hydrated but most importantly, to have fun ! Run for Løv is a healthy organic drink for your physical activities like yoga and running ! Try this invogorating superfruit infusion: an organic blend made of apple, hibiscus flower, pomegranate, blackcurrant and goji berry. Naturally caffeine free, this Løv Organic natural tea for athletes is delicious served hot or iced. Apple*, hibiscus*, rosehips*, pomegranate*, natural pomegranate, blackcurrant and redcurrant flavours, goji berries*, blackcurrant*. In Scandinavian countries 'løv', means 'leaf'. Løv Organic is inspired by the Scandinavian way of life, combining pleasure and ecology in an organic range of amazing teas and herbal teas that makes everyday life more beautiful. Tea contains tannins and polyphenols, these are rich in antioxidants, and is also rich in vitamins, notably vitamin P (to help strengthen hair) and vitamin B (especially vitamin B9) which helps to maintain general wellbeing. 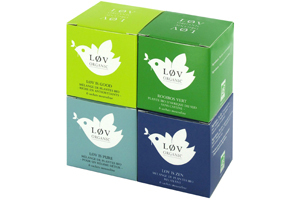 Premium organic teas from Løv Organic are then a source of pleasure and natural well-being !